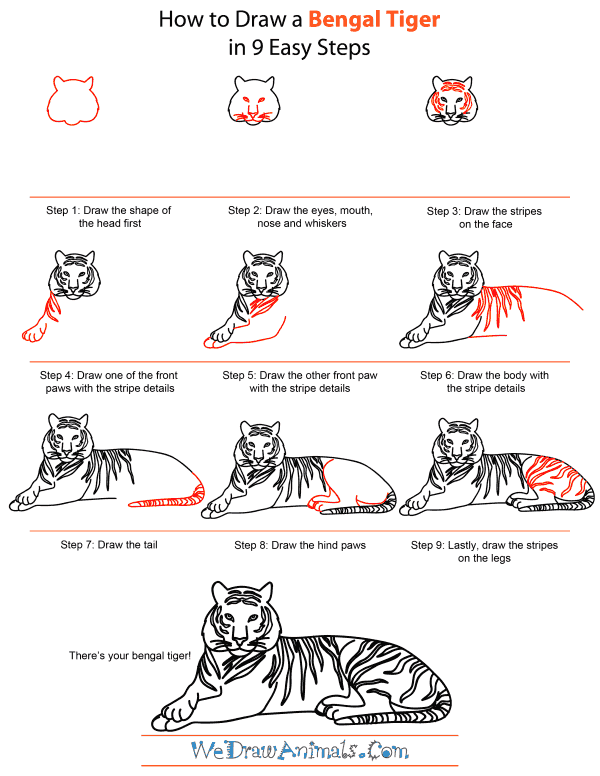 In this quick tutorial you'll learn how to draw a Bengal Tiger in 9 easy steps - great for kids and novice artists. 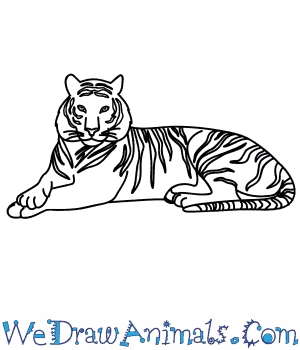 At the bottom you can read some interesting facts about the Bengal Tiger. Bengal tigers are the largest members of the cat family. They are known for their orange and white fur and black stripes. Bengal tigers are native to India, and they are also referred to as Indian tigers. In the wild, the average lifespan of a Bengal tiger is 8 to 10 years. Just like human fingerprints, no two Bengal tigers have the same pattern of stripes. Bengal tigers use their coats to camouflage themselves while they hunt for food. Bengal tigers are nocturnal. At night, they hunt for their prey, which includes wild pigs, deer, and other large animals. Bengal tigers can eat as much as 60 pounds of food in one sitting. Female Bengal tigers give birth to two to six cubs at a time. Their cubs stay with them until they are two or three years old, at which time they stake out their own territory. Cubs are not able to hunt for their own food until they are about 18 months of age. Bengal tigers are known to be powerful and solitary animals. They mark their territories with a scent so no other animal could enter their designated personal space.